Box 761 has been empty for a few days — it will take some time to make this a regular part of the day. It has been hot here, positively sultry, and much of my time is taken up with lazing about on the couch, reading books. I just finished the third and final book of the Millennium Trilogy by Stieg Larsson — otherwise knows as The Girl with the Dragon Tattoo, etc. I have seen them in book stores for a while now, and figured I might as well see what the fuss was about. Larsson was apparently the second-best-selling author in the world in 2008… who knew? They are not bad books, at all. I kind of enjoyed them — “kind of” because I wasn’t riveted to the book. Halfway through I did a shameful thing and looked at the last chapter to see how it ended. I think this means I cared about what happened to Salander (the “Girl”) but it could also mean that I wasn’t willing to do the work to get to the end honestly…. I read the entire book, but still, I knew how it ended. It could mean I have no impulse control, too. Hmm. Anyway. I read all three books in about as many days. For each, I read the last few chapters after I’d read about 100 or so pages. It doesn’t seem to ruin anything for me, and face it — it’s not high literature, right? I wanted to know what happened. Then I read how they got there. Kind of like eating your pie before dinner…. whatever. These books made me think. Not so much about the characters or anything, but about the fact that it made me realize just how few books I read (and let me tell you, I am a prodigious reader) that are not peopled by North Americans. It was refreshing, and I liked the glimpses I got of Sweden, Swedish life, and a European sensibility. I could do without the very detailed chapter on a shopping trip to IKEA, but I certainly hope that IKEA is planning on selling the “Lisbeth Salander Collection” in all of their stores. I couldn’t figure it out — why on earth would Larsson add that much detail? If I hadn’t been so lazy, I would have gone to the computer while reading it and checked it up. I know for a fact, though, that the IKEA website is a pain to navigate through and in the end I didn’t care enough. 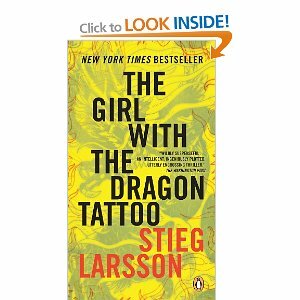 Quick fun tip (via Wikipedia): the first novel in the trilogy was called “Men Who Hate Women“, which somehow was translated into English as “The Girl with the Dragon Tattoo“. Huh. I can see why the publisher would have maybe balked at that…. If you’re interested, you should go to that Wikipedia page here. It’s full of lovely conspiracy theories and arcane facts.